Coitus is back with an impressive second print issue! 5 superstars grace 5 covers in this limited edition of 200 copies per cover! 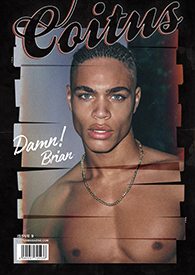 “Bite Me” features some of the hottest young male models today and collaborations from the best new talent around. Coitus is an independent magazine and would like to thank everyone who supported and made issue 1 a success and allowed us to make issue 2 a reality. Francisco and Arthur photographed by Greg Vaughan. River, Marlon and Sebastian photographed by Pantelis.